One of the keys to a healthy mouth is daily oral hygiene. These tasks have one objective: remove plaque, a thin film of bacteria and leftover food particles, from tooth surfaces. Plaque fosters bacterial growth that can cause diseases like tooth decay or periodontal (gum) disease. Brushing does an effective job removing plaque from the broad surfaces of teeth. But because plaque can also grow between teeth where your brush can’t reach, you also need to floss. Unfortunately, flossing is a lot of people’s least favorite hygiene task. It can be time-consuming and requires a little more dexterity than brushing. As a result, it’s common for people to brush but not floss — and potentially miss plaque that could trigger dental disease. There is an easier alternative to traditional string flossing: an oral irrigator. These countertop appliances deliver a stream of pulsating water at high pressure through a handheld device that looks similar to a power toothbrush. The user directs the water stream through the nozzle tip (which comes in various sizes) between the teeth. The water vibrates plaque loose and then rinses it away. Besides people with limited dexterity, water flossers are also ideal for individuals wearing braces or other orthodontic hardware. Because of the metal hardware on and around teeth, flossing can be an arduous task. An oral irrigator makes it easier to floss and reduce plaque buildup, a perennial problem for orthodontic patients. 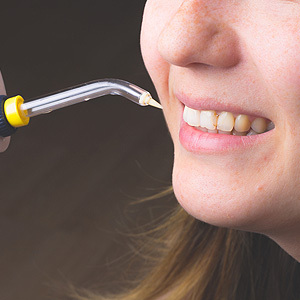 In fact, one study of orthodontic patients found that using an irrigator with a tip especially designed for braces removed five times as much plaque as patients using only a manual toothbrush. Of course, anyone can use an oral irrigator as an alternative to traditional flossing. Your dentist and staff can advise you on what to look for in equipment and provide instruction on how to use it. If traditional flossing isn’t your thing, consider an oral irrigator to get rid of plaque and keep your teeth and gums healthy and attractive.